Road Runner Girl: The Joys of an At Home Gym! Disclosure: This post is sponsored by Kohl's. I was provided with product and compensation. All the opinions are mine and mine alone. One of the biggest reasons people don't work out is because of lack of time. We can always find reasons or excuses to not work out: not enough time, too tired, want to watch tv and relax, can't afford a gym membership. The list could go on and on! But like anything in life...you have to work hard to get results. You have to make time for those things that are important to you. Kohl's makes it a little easier for us all to find that time to work out. What if you don't have to go anywhere to get in that workout? What if you can workout from the comfort of your own home? I know what you're thinking...what about the cost? Gym equipment is expensive! Well...I'm happy to say that Kohl's offers some amazing exercise equipment at a very affordable cost! So...what exactly do you need for an at home gym? 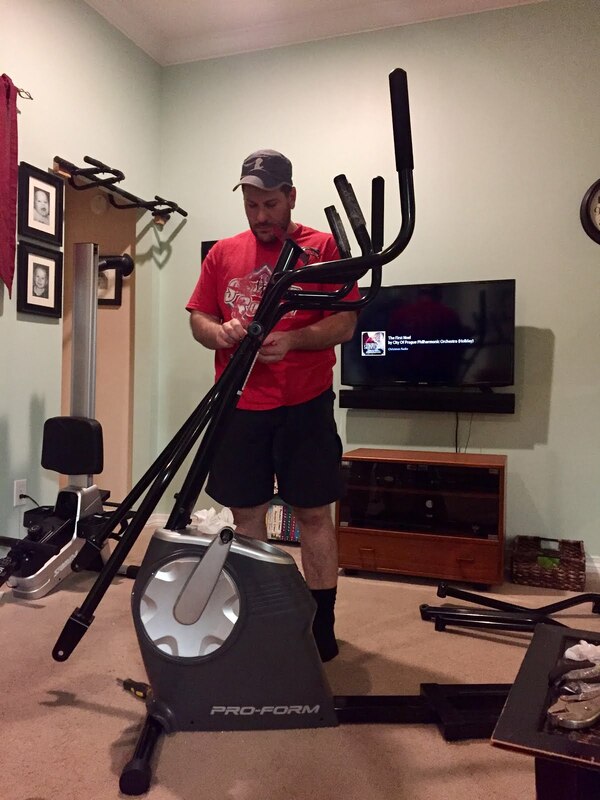 I believe it only takes a few pieces of equipment to have your own at home gym! You need cardio equipment. I recommend having at least 2-3 different pieces of equipment. You want to be able to vary your workouts. Doing the same thing every time you work out will not surprise your muscles. You need to keep your body guessing in order to see results! 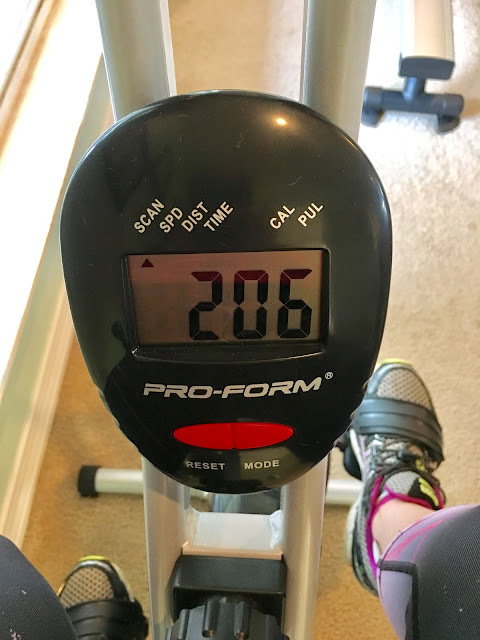 Kohl's provided me with 3 different pieces of cardio equipment...an exercise bike, a rowing machine, and an elliptical. They also provided me with a recovery piece of equipment...the BacTrack Back Massager. 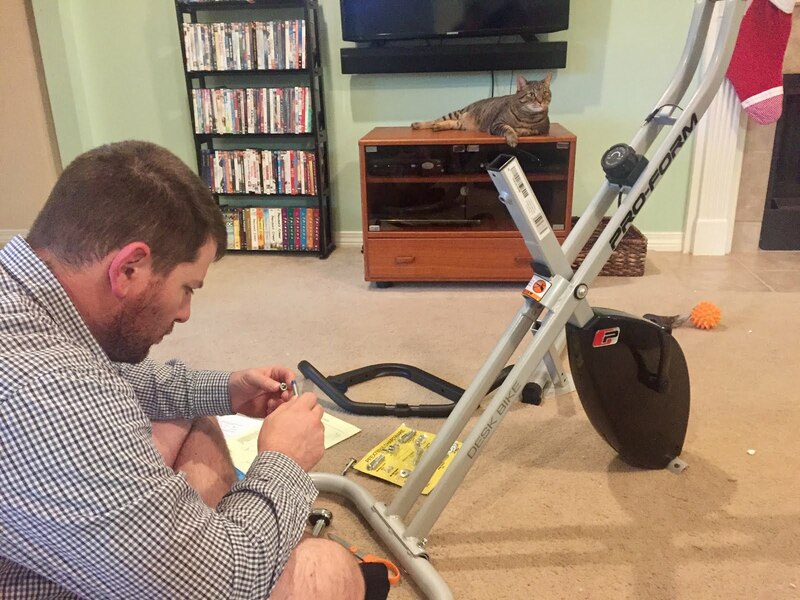 The exercise bike is one of the pieces of equipment that I don't particularly care for. I think it's boring to be honest. But this ProForm Desk X-Bike Exercise Bike comes with a desk! So I could read my book or watch a movie or blog...all the while exercising! It makes it much less boring! And if you don't want the desk...it detaches very easily! The display shows you the time, speed, distance, calories, and pulse (shows your heart rate in beats per minute if you are using the heart rate monitor). This bike was pretty simple to set up. My hubby had no problems putting it together! And it took him less than an hour! I love that this bike doesn't take up a ton of room. Since it's in my house I don't want it to take up too much space. I was also provided with the Stamina Magnetic Rowing Machine. This one is my husband's favorite! He loves that rowing is a full body workout! This one was also pretty easy to put together. 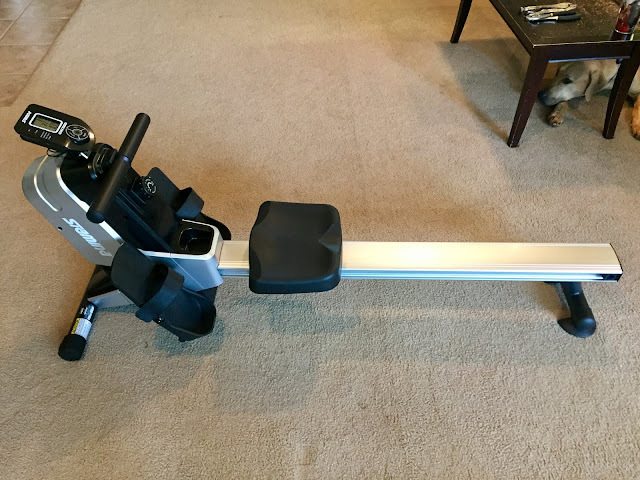 One of my favorite features is that this rowing machine will stand up to decrease the amount of space it takes up. The display shows you the total number of strokes, time, distance, calories burned, and the rowing speed. 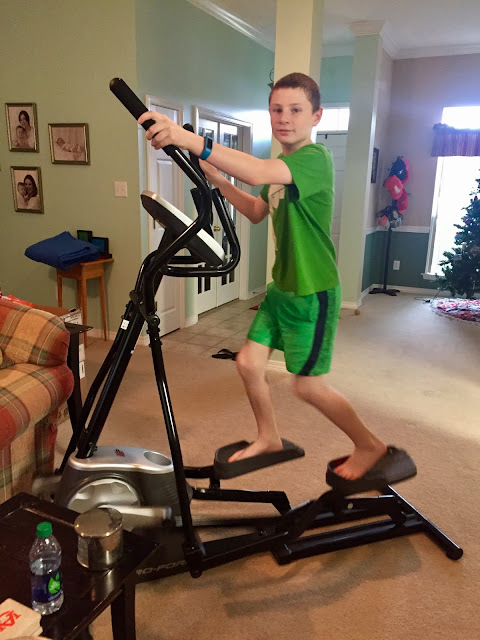 My favorite piece of equipment is the ProForm Easy Strider Elliptical! I've always loved ellipticals and this one is just as good as the ones I've used at the gym! This one took a little longer to set up but it was still fairly easy. This elliptical has front mech ellipticals so it takes up less space than the rear ones do. It also has wheels that make it super easy to move. I store it a certain way but when I use it I move it a bit so I can see the TV! This elliptical is iPod compatible so you can also listen to music while using it! And it has an 8 week weight loss program built in! There are 18 preset workouts...nine weight loss and nine performance workouts! The preset workouts will automatically change the resistance of the pedals as it guides you through the workout. My favorite part....it has a fan built in! So when you start getting sweaty and hot you can turn the fan on to help you cool off some! The display shows calories, distance, pulse (when using the heart rate monitor), resistance, speed, time, and a track. After working out it is important to stretch. I also believe in massage to help relieve sore muscles. Kohl's sent me the BackTrac Back Massager to help with this! I've been doing this every day and it really helps! Hurts so good!!! So what is the price for this home gym? Believe it or not...Kohl's has all of this equipment on sale for reasonable prices! Think of how much money you will save (rather than paying a gym membership fee every month) when everything you need is in your home! So for less than $1000 you can have your own gym in the comfort of your home! You can workout at any time of your choosing (don't have to wait for gym hours). You can even work out in your pajamas and no one will know! A bonus to having a home gym...your kids will want to workout too! It warms my heart to see them using the equipment instead of sitting on the couch playing video games! I'm so looking forward to be able to workout at any time in the comfort of my own home! 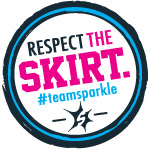 Let's start off the new year right....#MakeYourMove with some exercise!!! QOTD: Which piece of gym equipment would you want the most in your home?